Aim: The purpose of this study was to investigate change of working length in curved molar root canals after preparation with Profile, ProTaper and K3 Rotary Nickel-Titanium (Ni-Ti) instruments. Materials and Methods: One hundred and eighty maxillary and mandibular molars were divided into group I having root curvature angle <300 and group II having root curvature angle >300 comprising 90 teeth in each group based on Schneider's method. 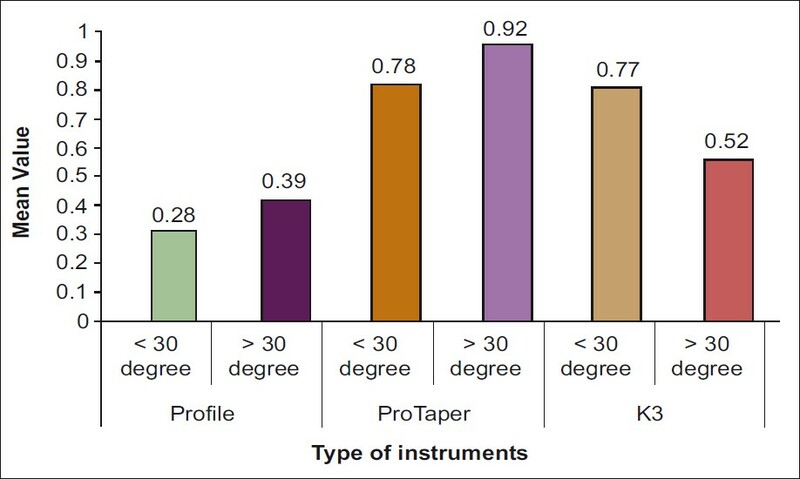 Group II and I were further divided into sub group A, B and C having 30 teeth each based on type of instrument used. Profiles, ProTaper and K3 Rotary Ni-Ti files were used to prepare mesial and buccal roots of molars. Radiography platform was made to allow technique for constant object to film distance and object to sensor distance. Conventional access opening was prepared in each tooth. Preoperative and postoperative working length was measured to an accuracy of 0.1 of mm on Dexis 3.0 direct digital radiograph's onscreen measurement device. Results: Mean loss of working length varied from 0.28 to 0.92 mm. Highest working length loss was seen in ProTaper followed by K3 files and Profiles, which is statistically significant. Root canal working length may be defined as the distance from a coronal reference point to the point of which canal preparation and obturation should terminate. Success has been found to be greatest in teeth in which the obturation material extended to within 2 mm of the radiographic apex but did not extend beyond the radiographic apex. Regardless of the method once the appropriate working length has been established, maintaining consistency of that measurement throughout the course of endodontic treatment is crucial and obturate to the desired apical location. This is particularly true in the instrumentation of curved canal. In vitro  studies have shown that changes in WL commonly occur during the cleaning and shaping of curved root canals. The rotary instruments used in study were, Profile (Tulsa Dental) rotary files have cross-sectional geometry of three equally spaced "U-Shaped" grooves. It has a 20 0 negative rake angle at the cutting edge and flat radial lends to cut dentin in a planing motion. ProTaper system (Dentsply, Switzerland) has convex triangular cross-section. This design along with progressive taper present in these instruments, result in reduced contact area between dentin and the cutting blade of the instrument. K3 rotary file system (Sybron Endo, CA) was designed by Dr. John McSpadden has asymmetrical cross-section. A series of three radial bands with a relief behind two of the three lands allows reduced friction on the canal wall. A slight positive "rake" angle provides more cutting efficiency. The purpose of this in vitro investigation was to compare pre and postinstrumentation change in WL in curved molar root canals prepared by Profile, ProTaper and K3 Rotary Ni-Ti files. Selection of teeth comprised of 180 extracted human maxillary and mandibular molars. The teeth were free of caries, had closed apices, without dilacerations and without any restorations. The teeth following extraction were cleaned free of debris and calculus and were then stored in normal saline. Conventional radiographs were taken in bucco lingual direction using E-speed film (Kodak), which was kept parallel to the teeth. Radiographs were taken for all the teeth; these radiographs were used to determine canal curvature. Tracing of the radiograph was done on cephalometric tracing paper and Schneider's method was employed to determine canal curvature. The Schneider's method employs first drawing a line parallel to the long axis of the canal in the coronal third; a second line is then drawn from the apical foramen to intersect the point where the first line left the long axis of the canal, the Schneider angle is the intersection of these lines. The angle formed is then measured with protractor. Mesial root of mandibular molars and buccal roots of maxillary molars was measured. Most severe angle of the particular tooth was used to categorize the teeth. Grouping for study is done as follows 180 extracted human molar teeth were divided into two main groups having 90 samples each based on the curvature of root canal. Group I curvature less than 30 0 .Group II curvature more than 30 0 . Group II and I were further divided into subgroup A, B and C based on the design of rotary file used having 30 samples each. Profiles, ProTaper and K3 files were used to prepare sub group A, B and C, respectively. Conventional access cavity was prepared in each tooth, with No. 2, 4 and 6 round burs and taper fissure bur was used to refine the access cavity. Each root canal was located with an endodontic explorer. Pulp extirpation was done with barbed broach. The canals were made patent with 08, 10 and 15 no K-file. Mesial root canals of mandibular molars and buccal root canals of maxillary molars were measured. All the canals were prepared using crown-down technique in sequence recommended by manufacturers. Files were mounted on a low-speed, high-torque electric motor (TC motor 3000) with a contra-angle 20:1 reduction hand piece (WH 975, Austria). Light pressure during instrumentation procedure was used together with back and forth movements of an amplitude of between 2 and 3 mm. Usage time for each instrument was maintained between 5 and 10 seconds. For Profile which were used as control are more elastic than other Ni-Ti files and they remain centered within the canal during instrumentation, due to three passive radial land. Profile orifice shapes No.4 (0.07 / 50), No.3 (0.06/40), 0.06/30, 0.06/25, 0.04/30, 0.04/25 files were used in sequence recommended by manufacturer. ProTaper rotary Ni-Ti endodontic instruments were used in crown down technique. K3 rotary Ni-Ti endodontic instruments were used as recommend by manufacturer. Orifice shapes of size (0.10/25) and (0.08/25) was used to enlarge coronal third. To enlarge middle third of canal 0.06 taper files of size 40, 35, 30, 25. For apical finishing 0.04 /25 and 0.04 /30 was used. After the root canal preparation was completed canals were thoroughly irrigated and dried. Last used rotary file till working length in each group was placed in the canal and teeth were transferred to the acrylic block and stabilized with modeling wax. Later acrylic block was transferred to the metallic sheet attached to the metal clamp and the metal clamp was attached to the X-ray tube head at the distance of 16 inch from X-ray source which was held perpendicular to the teeth and sensor. Postoperative estimated canal length was measured to an accuracy of 0.1 of millimeter on Dexis 3.0 DDR's (Direct digital radiographs) on screen measurement device by unlimited click with first click at occlusal reference point and last click at the most apical extent of working length. Pre and postoperative working length change was measured and compared for any loss in working length. The teeth in which file had fractured postoperative working length was not determined. Loss of working length was compared in 148 molar teeth, teeth in which rotary file had fractured working length loss was not determined. In Group I Profiles (control) showed mean loss of working length was 0.28 mm with ± standard deviation (SD) 0.12. Percentage reduction of 1.5% was observed. Paired t-test showed value of 16.5 and P-value < 0.001 which was highly significant. In Group II Profiles (control) showed mean loss of working length 0.39 with SD ± 0.13; loss of working length was 2.0%, paired t-test 19.8 and P-value < 0.001, HS. In case of ProTaper files in Group I mean loss of WL was 0.78 ± SD 0.16, loss was 4.2%, paired t-test 34.0 and P-value < 0.001, HS. In Group II ProTaper files showed mean loss of WL equal to 0.92 SD 0.17, loss of 4.7%, paired t-test 35.8 and P-value < 0.001, HS. In case of K3 files in Group I mean loss of WL 0.77 ± 1.40 SD, t-3.95 and P-value < 0.001, HS. K3 files in Group II mean loss of working length was 0.52 ± 0.17 SD, and loss of 2.8%, Paired t-value 25.2 and P-value< 0.001 HS [Table 1], [Table 2], [Figure 1]. Mean loss of working length varied from 0.28 to 0.92 mm. Highest working length loss was seen in ProTaper followed by K3 files and Profiles; which was statistically significant. Average loss of working length was small from 1.5 to 4.7%. Overall it was less than 1 mm. ProTaper showed highest working length loss followed by K3 files and Profiles (control group), which is statistically significant. 1. Sheilder H. Cleaning and shaping the root canal. Dent Clin North Am 1971;18:269-96. 2. Walsh H. The hybrid concept of nickel-titanium rotary instrumentation. Dent Clin North Am 2004;48:183-202. 3. Buehler WH, Gilfrich JV, Wiley RC. Effect of low temperature phase changes on the mechanical properties of alloys near composition TiNi. J appl phys 1963;34:1475-7. 4. Walia H, Brantley WA, Gerstein H. An initial investigation of the bending and tortional properties of nitinol root canal files. J Endod 1988;14:346- 51. 5. Thompson SA. An overview of nickel-titanium alloys used in dentistry. Int Endod J 2000;33:297-310. 6. Sjogren U, Hagglund B, Sundqvist G,Wing K. Factors affecting the long term results of endodontic treatment. J Endod 1990;16:498-504. 7. Catdwell JL. Change in working length following instrumentation of molar canals. Oral Surg Oral Med Oral Pathol Oral Endod 1976;41:114- 8. 8. Bergmans E, Van Cleynenbreugel J, Wevers M, Lambrechts P. Mechanical root canal preparation with Ni-Ti rotary instruments: rationale, performance and safety. Am J Dent 2001;14:324-33. 9. Hsu Y-Yi, Kim S. The profile system. Dent Clin North Am 2004;48:69-85. 10. Clauder T, Baymann MA. ProTaper NT system. Dent Clin North Am 2004;48:87-111. 11. Mounce RE. The K3 rotary nickel-titanium file system. Dent Clin North Am 2004;48:137-57. 12. Sydney GB, Batista A, De Melo. The radiographic platform: A new method to evaluate root canal preparation in vitro. J Endod 1991;17:570-2. 13. Avinash M, Kamath PM. Canal length estimation in curved root canals-A comparison between conventional and direct digital radiography. Endodontology 2002;14:52-60. 14. Schneider WE. A comparison of canal preparations in straight and curved root canals. Oral Surg Oral Med Oral Pathol 1971;32:27-35. 15. Bunger CL, Mork TO, Hutter JW, Nicole B. Direct Digital Radiography versus conventional Radiography for estimation of canal length in curved canals. J Endod 1999;25:260-63. 16. Schrader C, Ackermann M, Barbakow F. Step-by-step description of a rotary root canal preparation technique. Int Endod J 1999;32:312-20. 17. Thompson SA, Dummer MN. Shaping ability of profile .04 Taper series 29 rotary Nickel-Titanium instruments in simulated root canals. Int Endod J 1997;30:1-7. 18. Schroeder KP, Walton RE, Rivera ME. Straight-line access and coronal flaring: Effect on canal length. J Endod 2002;28:474-6. 19. Davis RD, Marshall G, Baumgartner JC. Effect of early canal flaring on working length change in curved canals using rotary Nickel titanium versus stainless steel instruments. J Endod 2002;28:438-42. 20. Bryant S, Dummer P, Pitoni C, Bourba M, Moghal S. Shaping ability of .04 and .06 taper ProFile rotary nickel-titanium instruments in simulated root canals. Int Endod J 1999;32:155-64. 21. Iqbal MK, Floratos S, Hsu YK, Karabucak B. An in vitro comparison of Profile GT and GTX nickel-titanium rotary instruments in apical transportation and length control in mandibular molar. J Endod 2010;36:302-4. 22. Berutti E, Chiandussi G, Gaviglio I, Ibba A. Comparative Analysis of Torsional and Bending stresses in Two Mathematical Models of Nickel-Titanium Rotary Instruments:ProTaper versus ProFile. J Endod 2003;29:15-9. 23. Bergmans L, Van Cleynenbreugel J, Beullens M, Wevers M, Van Meerbeek B, Lambrechts P. Progressive versus constant tapered shaft design using Ni-Ti rotary instruments. Int Endod J 2003;36:288-95. 24. Peters OA, Peters CI, Schonenberger K, Barbakow F. ProTaper rotary root canal preparation: effects of canal anatomy on final shape analyze by micro CT. Int Endod J 2003;36:86-92. 25. Nagaraja S, Sreenivasa Murthy BV. CT evaluation of canal preparation using rotary and hand NI-TI instruments: An in vitro study. J Conserv Dent 2010;13:16-22. 26. Guelzow A, Slamm O, Martus P, Kielbassa. Comparative study of six rotary Nickel-Titanium systems and hand instrumentation for root canal preparation. Int Endod J 2005;38:743-52. 27. Schafer E, Florek H. Efficiency of rotary nickel-titanium K3 instruments compared with stainless steel hand K-Flexofile. Part 1. Shaping ability in simulated curved canals. Int Endod J 2003;36:199-207. 28. Ayar LR, Love RM. Shaping ability of Profile and K3 rotary Ni-Ti instruments when used in a variable tip sequence in simulated curved root canals. Int Endod J 2004;37:593-601. Maitin, N. and Arunagiri, D. and Brave, D. and Maitin, S. and Kaushik, S. and Roy, S.